A Russian Proton rocket blasted off Friday from Kazakhstan with a Canadian communications satellite to link Brazil and other parts of the Americas with broadband Internet and video services. Known in Brazil as Estrela do Sul 2, meaning "southern star" in Portuguese, the Telstar 14R satellite is beginning a 15-year mission to provide Ku-band communications to the Americas and Atlantic Ocean regions. Telstar 14R will be operated by Telesat of Ottawa, Canada. The satellite will replace the crippled Telstar 14, or Estrela do Sul 1, spacecraft that failed to fully deploy one of its solar panels after launch in 2004. Faced with diminshed electricity, Telesat put the impaired craft in service with a fraction of its planned communications capacity. The Canadian satellite operator ordered a replacement spacecraft in 2009, selecting Space Systems/Loral of California to build Telstar 14R. Space Systems/Loral also manufactured the Telstar 14 craft. "Telstar 14R is about twice the size of the satellite that it's replacing, Telstar 14," said Dan Goldberg, president and CEO of Telesat. "It's an all Ku-band satellite with five different beams providing our customers in these really fast-growing areas much better, higher quality, more powerful capacity than the satellite that Telstar 14R is replacing." The 10,957-pound satellite launched at 1915 GMT (3:15 p.m. EDT) Friday on a Proton rocket from the Baikonur Cosmodrome in Kazakhstan. It was just after 1 a.m. Saturday at the launch site. Pushed into the sky on a pillar of flame from six RD-276 main engines, the 191-foot-tall Proton booster soared into space and shed its three core stages before yielding to a Breeze M upper stage in less than 10 minutes. The Breeze M upper stage completed the first of five engine firings to place Telstar 14R in a low-altitude parking orbit about 16 minutes after liftoff, according to Russ Prytula, program director at International Launch Services, the U.S.-based company managing commercial Proton missions. Four more Breeze M burns raised the payload's altitude and reduced its orbital inclination. The upper stage released Telstar 14R at 0428 GMT (12:28 a.m. EDT), according to ILS. The Proton and Breeze M were targeting an orbit stretching between 5,500 miles and 22,236 miles above Earth. "We knew how critical it was to launch Telstar 14R on schedule to replace Telstar 14 for Telesat," said Frank McKenna, ILS president. "With the early delivery of the satellite by Space Systems/Loral, ILS and Khrunichev were able to provide the flexibility needed to integrate and launch Telstar 14R well before the expected timeframe." Telstar 14R's own engine will circularize its orbit at an altitude of 22,300 miles in the next few days, moving the craft into position over the equator. The satellite's operational position will be at 63 degrees west longitude, where its five communications antennas and 46 Ku-band transponders will reach customers across the Americas and the Atlantic Ocean. The communications payload is divided between five beams focusing capacity on Brazil, the Atlantic Ocean, the continental United States, the southern cone of South America and the Andean region, including Central America. Ground controllers will have the ability to switch 19 transponders to address changing market demand. The other 27 Ku-band transponders are fixed. 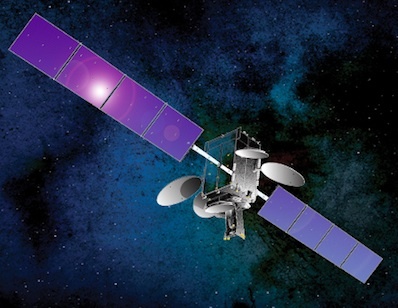 "There is substantial switching capability on this satellite to adapt to market conditions as they change," said Mike Minhas, program director at Telesat. Delivered in less than two years from the contract award, Telstar 14R ensures service continuity for users of the partially disabled Telstar 14 craft, according to Telesat. "The Telstar 14R satellite is an extremely capable satellite that will double the capacity of the satellite it replaces and provide significantly improved geographic coverage and higher power signals," said Patrick Van Minnen, Telstar 14R deputy program manager at Space Systems/Loral. Based on Loral's 1300 spacecraft bus, Telstar 14R is designed for a 15-year life in orbit, Van Minnen said. 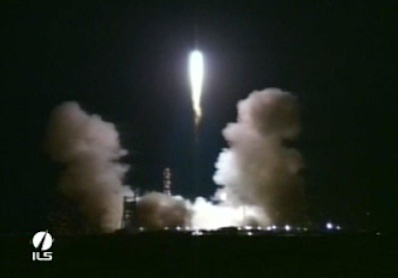 Friday's launch was the first flight of a Proton rocket this year. About a dozen Proton missions are planned for the rest of 2011, including seven or eight commercial flights and four or five launches for the Russian government, McKenna said. The flight rate will match the 12 missions the Proton accomplished last year. "However, it will be a more compressed timeframe," McKenna said. "It will be between May in December this year. That's a significant increase in production capability and quality." A new Proton rocket processing facility allows launches every 15 days, according to McKenna.